There were many other issues to be resolved in the meantime. course inside and out plus the walls needed dry lining ready for plastering. make them usable with the old rods. 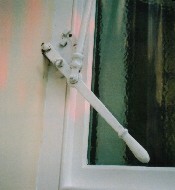 Sand blasting revealed that the original Victorian cresting was much more interesting when stripped. 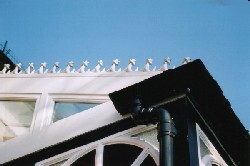 The pot shelving was remade and the gallows brackets blasted and painted. The glass proved a great challenge. 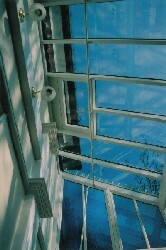 For the main panels, "drawn" glass was used. This is glass made in the old style before the "float glass" process, with wobbly distortions and all! (It looks gorgeous and is well worth considering on modern buildings.) 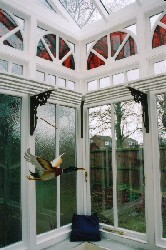 The side panels facing the road were originally "Cathedral glass" for which Pilkington "Minster" glass was a close match. The cartwheels had a solid deep red glass and we were able to find a supplier who could supply "Pot Red" pure coloured glass for this. The most difficult glass to source was the fine pattern used in the Georgian squares and the top corners of the cartwheels. Nobody in Europe has a small pattern glass available, not like the fine old Victorian patterns. Our specialist glass supplier in London finally managed to find an acceptably close match in America but we had to wait a few months for them to deliver it to our sealed unit manufacturer, well worth the wait though (take note, Pilkington!). All of these glasses were made into sealed units using toughened Pilkington 'k' heat reflective glass as the inside sheets.